Take one bowl, add rawa, curd, salt, ginger paste, garlic paste and mxi well. Add ¼ cup water and make semi thick batter. You can add required water to adjust batter consistency. Leave it for 30 minutes. Meanwhile boil water in steamer and grease plate with oil. Again take batter bowl, add oil, fruit salt and mix well. So batters become pluffy. 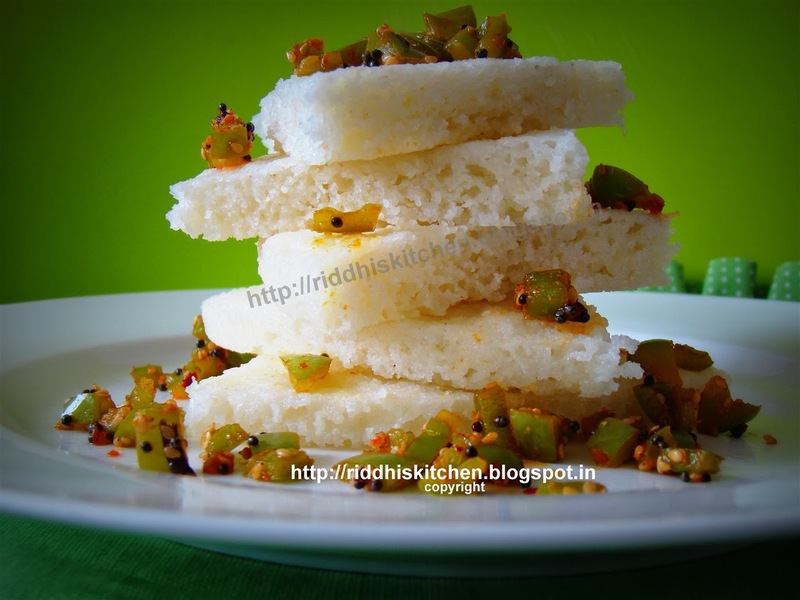 Take dhokla plate and pour batter and make semi thick layer and steam for 15 to 20 minutes on high flame. Check by inserting a knife. If knife comes out clean, it is cooked. Let it cool down for 15 minutes and cut into your desired shapes. Heat oil in pan, add mustard seeds, and let them splutter. Add capsicum, salt, red chilly powder, sesame seeds and just stir fried for 1 to 2 minutes. Take serving plate, arrange dholka pieces, and top with capsicum topping.